What is a Mechanical Heart Valve? A mechanical heart valve functions similarly to a tissue valve. Its purpose is to allow blood to flow through the heart by opening and closing with each heartbeat, just like a healthy heart valve. While tissue valves are made from animal tissue such as pig or cow, mechanical valves utilize materials such as pyrolytic carbon, titanium coated with pyrolytic carbon, Teflon, polyester, or dacron, depending on the specific valve and component of the valve. This makes mechanical heart valves more durable than tissue heart valves. Because of their durability, mechanical heart valves are much longer lasting than tissue valves, which means you most likely won’t need a replacement further down the line. This isn’t the case with tissue valves, which typically need replacing after 10 to 18 years. It’s also important to consider which heart valve needs replacing. 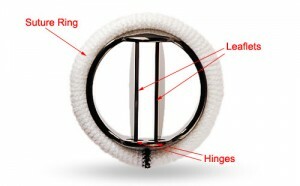 If the mitral valve (valve responsible for closing off the upper left chamber of the heart) requires a replacement, a mechanical heart valve is said to last until age 70. However, if it’s the aortic valve (valve that closes off the lower left heart chamber) that requires a replacement, mechanical heart valves are not as effective beyond age 55. One of the biggest risks of mechanical heart valves is the formation of blood clots on and around the valve. Sometimes, clots formed on the valve itself lead to the malfunctioning of the mechanical valve. Other times, these blood clots can break off and make their way to the brain, causing strokes. To prevent these life-threatening situations from occurring, patients with mechanical heart valves must take blood thinners such as warfarin on a daily basis. It’s very important for these patients to receive regular blood tests to ensure the thickness of their blood has not increased or decreased beyond safe levels. Warfarin must be temporarily stopped if the patient needs to undergo any future surgical procedures later in life, as it can cause bleeding. This risk increases with age. Unfortunately, this small pause also increases the chance of blood clots.